Montreal, Quebec, Canada, April 5, 2018 – MONARQUES GOLD CORPORATION (“Monarques” or the “Corporation”) (TSX-V: MQR) (OTCMKTS: MRQRF) (FRANKFURT: MR7) is pleased to announce that it has retained BBA to conduct a conceptual study for the transportation of gold-bearing material from the Wasamac deposit to an existing processing plant with an authorized tailings management facility in the region for custom milling. Since acquiring the Wasamac Gold project from Richmont Mines, Monarques’ management has been working towards unlocking the tremendous potential value of the project. Monarques’ management has made it a priority to investigate any and all avenues to make Wasamac economical and profitable at a significantly lower gold price than the scenario that the previous owner was working with. A major breakthrough that Monarques has achieved is the realization that the Wasamac Gold project can be serviced by bulk, railcar transport. 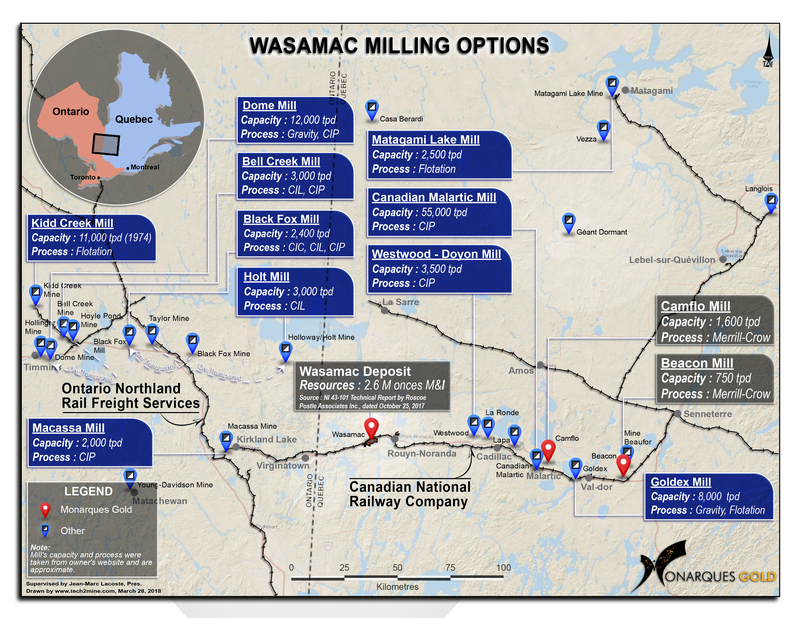 As such, Monarques could eliminate the extremely large capital outlay required to build a mill as it could potentially ship the Wasamac ore to any of a number of possible custom milling opportunities in the vicinity of Wasamac (see map of potential sites). The first phase of the study will establish an inventory of the main mining and processing sites in operation and accessible by road and/or rail in the Abitibi region, in both Ontario and Quebec, with their locations and qualifications. The second phase will develop a concept for the transportation of mineralization and/or treatment sludge for the three best options selected from the sites identified in the previous phase. The main goal of this phase is to design a concept for transporting the mineralization from the Wasamac deposit to a regional processing plant and tailings facility for custom milling. The Corporation expects to receive the results of this study in May 2018.